Cards and checks are not magic money generators. Ideally, children this age should regularly see their parents paying cash, and should be able to view the cash available for use. Pre-elementary understanding needs tangible evidence that payment amounts vary and payment sources are not inexhaustible. Some priorities are higher than instant gratification. Even knowing how much is available, four-year-olds may not accept your explanation of why soap has to be purchased before chocolate. However, they can empathize if you explain how you wish you could eat cheesecake with every meal, but then there wouldn’t be money to fill up the gas tank and drive to the store for more cheesecake. Everyone has some power over what’s available to spend. Even three-year-olds can do chores to earn extra spending money. Separate these jobs from the kids’ regular household chores; and give them opportunity to volunteer, rather than telling them they’re going to empty the wastebaskets for a dollar. Not all paying jobs are at home. While few kids under fifteen are ready for salaried jobs, they can hire themselves to neighbors for chores, and can organize enterprises like lemonade stands. Savings add up. 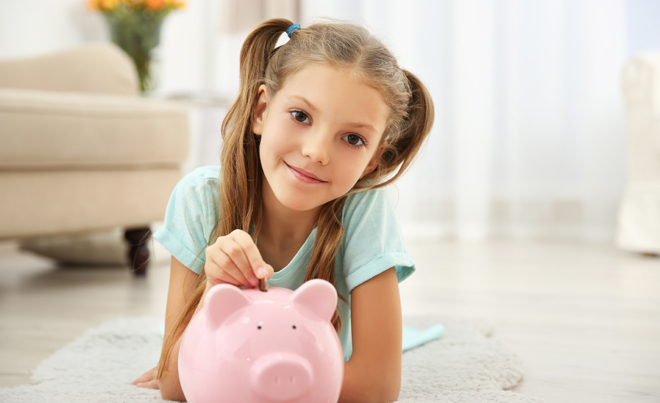 Help your children open bank accounts as soon as they can write their names. Encourage them to choose an amount to save weekly. Show them how their balance is growing, and let them plan something special to buy with the accumulated funds. Everyone should give back. Have the kids designate a percentage of all earnings and allowances for charitable donations. Let them participate in fundraisers (and don’t take it on yourself to buy their unsold candy!). Everyone is part of the overall economy. As soon as your kids are old enough, encourage them to get standard jobs (or to learn the regulations for founding a business). One can’t learn too early that professional bosses are stricter about professional bearing. The less buying on credit, the better. Many youngsters, when they reach the age for personal credit cards, regress to the mindset that says if the card is there, the money must be. Ideally, allow only debit cards until the user is a legal adult. Explain early on—with concrete examples—how interest adds up. If you’re old enough to be independent, you’re old enough to pay the bills. Unfortunately, the human brain doesn’t fully mature until about age 25, long after “children” are legally beyond parental control. Raising yours with awareness of financial responsibility will keep them from many foolish-young-adult mistakes, but still, you may sometimes have to ignore parental “rescue” instincts and let your kids take the consequences of going into debt with no one else to pay it. The good news is, lessons learned through experience stick the best. Let kids of all ages learn that way as often as possible. And, above all else, set an example of wise money management!